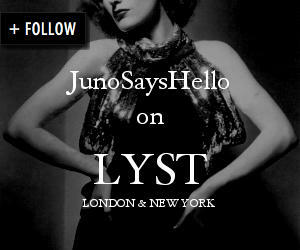 JunoSaysHello.com blog: Our frock makes Vogue's Best Dressed List! Our frock makes Vogue's Best Dressed List! The lovely Gizzi Erskine attended the Observer Food Monthly awards ceremony last week wearing a Juno Says Hello dress. Vogue chose Gizzi in this outfit for their weekly Best Dressed List... check out the photo here! Dress available to buy from Juno Says Hello - click on this link.